Retro and modern collide to create an inspiring mid-century wedding shoot at Ruffled, photographed by Red White and Green Photography. If you jump over there you'll see all the lovely handmade details, like the string art placecards and paint chip garland. 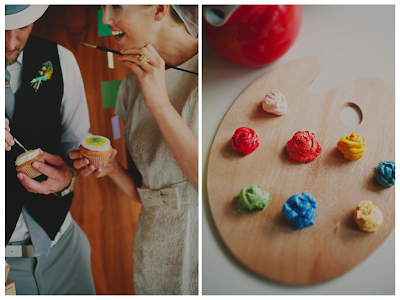 But my favorite idea is the "Paint Your Own Cupcake" station. For this styled shoot, it looks like they used globs of frosting on an art palette that guests apply with paint brushes to fondant topped cupcakes. You could use edible markers, too. 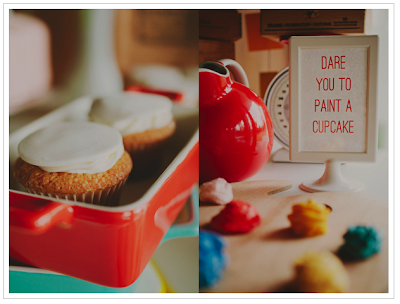 This is so perfect for any art-themed party, but also a fun way to let guests decorate their own take-home cupcake favor.